Do you like hand blocked fabric? Well then you will like that you can go here and buy it for a little less than $6.00 a yard. Happy indeed! I love the quality touch of hand blocked prints. A pink and orange combo always feels so happy to me. Girlfriend - you're spillin the beans here. One of my favorite sources! I love hand blocked anything and I'm so obsessed with India lately. Keep trying to get my husband to take me to Jaipur. I can't get enough of block print. Thanks for sharing this awesome site!! No WAY! I have an old, Turkish (I think!) wood block somewhere - I make some rudimentary art with it years ago, but have always thought about trying it on fabric. However, at that price, it's almost not worth it! Awesome! These are all so pretty! spill the beans i say! great source, we appreciate you sharing. Great source, thanks for sharing for sure! My parents have a load of hand blocked fabrics and linens...it's all gorgeous. They also gave me their vintage hand block print stamps, which I use for my pottery, makes for lovely patterns on plates. I just placed my order! Thank you!! This will be perfect for the vintage tunic pattern I found!! Happy Monday indeed! Thank you, thank you, thank you. 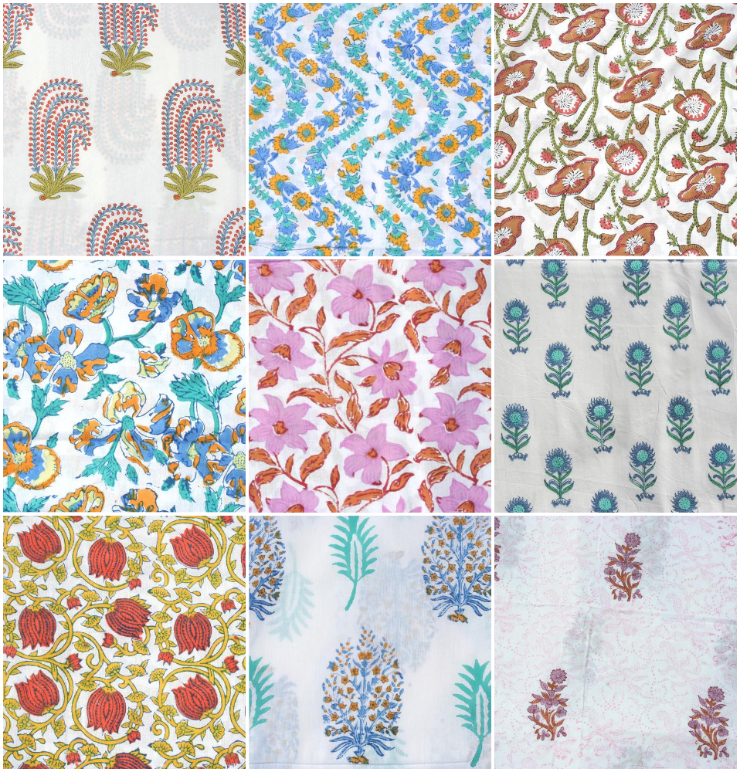 i love the look of these fabrics..they are bright yet delicate. and affordable TOO? I am from India, we are also doing hand block kalamkari printing in Andra Pradesh. contact no - 00919246863649. M.Radha krishna.